Anyone following the news lately can see that Flo’s in trouble. 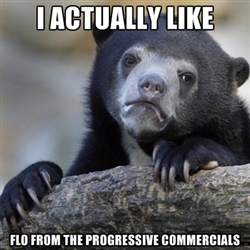 Well, not Flo really. Love her or hate her, she has come to personify the Progressive brand. But Progressive hurt its own brand image through its response to claims that the insuror went against its own customer in court, backing the defendent to avoid paying the victim’s family. In short, Progressive took a tough-to-defend position, and when it went viral they tried to robo-tweet their way out. Since then I’ve heard murmurings that maybe the financial industry needs to stay out of social media. The complaint that first went viral came via Tumblr, and exploded from there. Even if Progressive wasn’t ‘social’, this would have been public already. Progressive’s misstep was to auto-tweet a response to each and every complaint. Misstep may be an understatement – by auto-tweeting a cold, legalese response, the company instead made a mountain out of a molehill. Don’t look at Progressive’s debacle as a cautionary tale against social media – instead, look at it as a cautionary tale against social media’s misuse. Progressive’s auto-tweets were a serious error. Social media instead could have been used respectfully and responsibly to address the issue – perhaps directing those interested in a video by Progressive CEO Glenn Renwick (not Flo – save her for the ads) talking about the case at hand. A look at Progressive’s newsroom shows not one mention of the incident – this would have been a perfect spot to house a singular, definitive response. Social media has changed the landscape of news, information, and interaction. It’s here to stay. So get on board – and look to cases like the Progressive Auto-Tweet Debacle of 2012 as a perfect study of how NOT to use the medium. – A look at a credit union’s Facebook launch (via Financial Brand). – SVP of Social Media at Citi, Frank Eliason, is #positivelysocial. You’ll find his blog here. Should Banks Go Fishing for Generation Z?